I’ve decided to see this eclipse in Tennessee! Eclipse day is drawing nearer, and I’m almost finished with my series on trip-planning for the big event. Of course I’m assuming you are in fact going to see it. You are, aren’t you? Note that a partial is not even close to the same experience as a total eclipse. You simply must be under the path of totality. If you’ve never seen one before, you’re in for a real treat! An unfortunate corollary to the very convenient path of this eclipse is that nearly everywhere along the relatively narrow path of totality will be busy and crowded. Rooms have been booked for in many cases years. Campsites are at a premium, and even the good spots to watch (such as Jackson Hole) will be very crowded. Traffic is certain to be a headache. You may wonder if it is worthwhile at all. Why not just look at the videos and pictures that will be all over the web afterwards? Don’t think that way! Pictures cannot even begin to do justice to a total solar eclipse. Read on for tips on handling the crowds and getting a good spot. Where are you watching the eclipse? Bottom line is, while you want to see it in an inspiring place, it cannot be so crowded that it negatively impacts your experience. Your choice of viewing spot boils down to a subjective balancing act. Where you strike that balance depends on your personal make-up. Do you want as much peace and quiet as you can get? Or do you see the crowds as a great opportunity for an eclipse party? You have probably already reserved a place to stay, but what about a spot to watch the eclipse? Do you have a backup (or two)? Arrive in the area with plenty of time to scout one out. In a previous post I detailed all the qualities of a good place to watch a solar eclipse. But look for elevated places with good views of the sky and toward the horizon to the west (and east if possible). Find at least one backup spot, just in case something (like weather) happens with your top choice. Then for each of your spots, create at least one backup plan for parking and for how to get there. I recommend bringing a bicycle in case traffic and parking turn out to be worse than expected. Your backup spots should be in different areas weather-wise. In other words get some local knowledge on the area’s microclimates and diversify on that basis. Generally speaking this won’t work if a large front comes in, rather it’s for limited cloudiness, such as for thunderstorms. A friend of mine has two sets of reservations, one in Idaho and one in Charleston. Now that is a backup plan! Get your top spot scouted out and commit to it. Definitely monitor forecasts and satellite imagery in the day or two leading up to the event, but remember that weather is quite unpredictable more than 48 hours out. In other words, don’t get caught over-thinking it and end up faking yourself out. See next post for more on last-minute weather considerations. For any total solar eclipse you should get to your spot as early as possible. And for this particular eclipse that advice is especially important to follow. If you possibly can, camp right where you’ll be watching. Avoid driving on eclipse day. If you’re not sleeping within walking (or biking) distance I recommend driving in the pre-dawn hours, shooting sunrise, and getting to your viewing spot in the very early morning. Hotel rooms may all be booked, but what about camping? Is it also too late if you have no campsite reserved? It depends on where you’d like to camp. Don’t expect to score a spot at Jenny Lake in the Tetons or at a state park on the Oregon Coast. But if you’re flexible you may not be completely out of luck. All it takes is some creativity and persistence. If you’re self-contained, with plenty of water, food, etc., you should be able to find a spot to stay overnight in one of the national forests along the path. This is what the USFS calls “dispersed camping”, and the best part is it’s free! There are limits and rules, so check the websites for the districts you’re interested in. In addition most national forests, have 1st-come, 1st-serve campsites. These normally have at least fire-rings, picnic tables, an outhouse, plus (usually) water. The Bureau of Land Mgt. (BLM) also has dispersed and 1st-come camping available. BLM units in the path of totality are located in Oregon, Idaho and Wyoming. If you live close enough to the area under the path where you’ll be watching, and you don’t have accommodation yet, take a weekend (soon!) and drive around the area. If you don’t live close, arrive as many days ahead as possible, combining your search for a viewing spot with one for a campsite. You’ll be checking national forest and/or BLM land for dispersed camping. Stop by the national forest district offices for info. and recommendations. Find out about limits on lengths of stay, fire restrictions and leave-no-trace camping advice. Pick up maps either ahead of time or when you visit the district offices. In some cases you can download and print detailed maps, but never rely on Google Maps for this kind of thing. They have nowhere near the detail you need for scouting and planning. Draw the path of totality and confine your search for camping inside that path. The goal is to camp within walking distance of a great spot to watch the eclipse. Now it’s time to scout! There’s no substitute for taking the time to drive the back roads. Explore and get the lay of the land. The kind of places that should interest you depend on how you’re set up for camping. Obviously it’s best if you don’t have a large RV. A small camper van or a pickup that you can sleep in the back of is ideal for dispersed camping. You can also car-camp with a tent. The Forest Service allows you to disperse camp up to a few hundred feet off the road. Whether you camp in a vehicle or in tents, you need space to park so you’re not blocking the road. Finally, remember that there will be many people camping anywhere they can fit. The sooner you can claim a spot the better. Don’t limit yourself to public lands. People with property along the path of totality will no doubt be out to make a little money. Check Craigslist, but it may be better in this case to go low-tech. Call the local chambers of commerce in the area to find out if they know of specific landowners who are renting out space. Then drive around the area talking to locals with property for camping (or who are renting out rooms). Make sure to stress the fact you are self contained and will only be sleeping there, not spending a lot of daylight hours. Negotiate! That’s all for now. I hope you can use the advice I and others are offering to help make your eclipse experience a memorable one. But mostly, I really hope you have decided there is no way you’re missing this eclipse. Have a wonderful weekend! Large swaths of prairie lie under the path of this eclipse. Lets continue with Glacier National Park in springtime. This post will suggest things to do if you visit the park in early season (May & June). Check out the introductory post too. I visited this beautiful park in NW Montana last month. Though much of the park was snow-free, most of the high country was inaccessible because of snow. The famous Going to the Sun Road, which crosses spectacular Logan Pass, was closed from the Avalanche trailhead & campground on the west side all the way over to the east entrance at St. Mary Lake. Spring was in the air at lower elevations, with green meadows, flowers and busy critters. That atmosphere, combined with relatively few other visitors and all those waterfalls made the trip very worthwhile, despite Logan Pass & St. Mary Lake being closed. A Caveat: If you’re going to Glacier to knock some shots off your photography bucket list, you should stop reading right now and find another avenue of research. For one thing, it being early season, I wasn’t able to access ever-popular Triple Falls or St. Mary Lake (at Sun Point). So I’m not much help for these two very popular places to shoot at Glacier. The internet features thousands of pictures from these two spots, and it seems everybody with a camera wants to (or feels they should) see and shoot them. They’re on the itinerary of every photo workshop at Glacier (they have to be, people would feel cheated if they weren’t). That’s why, as those who’ve been reading this blog for awhile have probably already guessed, I’ve happily skipped them on all my trips to the park, even in summer or fall when they’re accessible. Besides, I don’t need to keep a group of workshop participants happy. And I don’t do bucket lists. Rivers & lakes are plum full in spring. So it’s a great time to float the Flathead (north or middle forks) in a raft. These rivers approach Class III but are mostly mellow Class I & II. Look for outfitters based in Kalispell or Whitefish, or closer to the park at West Glacier. This is a favorite weekend activity for local residents of the Flathead Valley. ** Action shots on the river, especially if you’re able to capture people’s expressions in the great light of a lowering sun, will make you popular with companions. If you’re nervous about shooting on the water, buy a relatively inexpensive waterproof point and shoot camera. But the chances of capsizing on the Flathead, especially in a raft, are slim indeed. Swiftcurrent Creek spills over a raucous waterfall from the lake of the same name. Camping lakeside is a wonderful way to spend a weekend in May or early June here. Lake McDonald is an obvious choice, but Bowman Lake, also on the west side, is more out of the way and gorgeous as well. You’ll need to drive a gravel road into Bowman, but it’s well graded for 2WD, and in early season not too washboarded. On the east side, camping (and hiking) along Two Medicine Lake is a superb choice. ** Campfire pictures (and videos) are sure winners. I’m talking people pictures, not close-ups of the fire. Help to get your group in the mood to sing and dance, then stand back with your camera on a tripod and capture both freeze-frame (higher ISO) and movement-blur shots. Or zoom in for a close portrait of someone telling a story, face to the firelight. Can you think of other ideas? As long as you’re camping by a lake, spring is a fantastic time to paddle, either in kayak or canoe. Morning is best to avoid any wind that may come up. And drop a line if you’re so inclined. ** Photograph canoes & kayaks in quiet, peaceful, and watery settings at sunrise, sunset, or even in the moonlight. Shots of people (fishing?) or just the empty boats can both work. Sure these can look a bit cliche, but if you’re genuinely trying to capture the mood of a peaceful paddle, these types of pictures can really shine. Of course sunset or sunrise by a lake also provides the perfect chance to shoot landscape if the light is right. Wildlife watching & photography is great this time of year. Dusky grouse were mating when I visited in May, and the deep “thump thump thump” calls of the male permeated the forest everywhere I went. I saw moose and plenty of deer, along with bighorn sheep. Mountain goat are quite common as well, especially if you hike to one of the high rocky ridges, such as Apgar Lookout near the western entrance. I didn’t see bears this time, but they are mostly out from hibernation at this time of year. Note: there are plenty of grizzlies in this park, so travel in groups if possible and make noise when you’re hiking (especially if alone) in areas where you can’t see far (no bells, loud talking instead). Discretion is the better part of valor: shoot grizzlies from a distance! ** You have to be patient to get pictures of dusky grouse, but the males (like males of any species, including us) are easier to approach when they’re displaying and their minds are elsewhere. The real challenge is to get a shot of a female! ** Bighorn sheep are fairly easy in most areas of Glacier because they are habituated to humans. But in order to observe more natural behaviors, and to get close to young ones, you need some patience. For both sheep and goats, if the terrain and your abilities allow, climb above them at a fair distance and circle around. Then descend slowly, approaching from above. That tends to keep them much more relaxed than if you were to approach from below, where most of their danger comes from. Dusky grouse displaying his inflatable neck sac, the sound a deep thump-thump. Next time I’ll cover hiking at Glacier. It might have to wait until a follow-up trip in a few weeks, after which I’ll be able to recommend not only good trails for spring, but perfect hikes for summer as well. Happy traveling! Spring flowers bloom above Flathead Lake, Montana. The granite mountains of Sierra de San Pedro Martir National Park in Baja California Norte, Mexico catch the low sunlight of a December afternoon. I have visited this out-of-the-way park on Mexico’s Baja Peninsula before. I had my telescope then, and the night sky of Baja was what drew me up to this 2500-meter high park of granite mountains and meadows. It’s a forested and beautiful place that sits high up on the mountainous spine of the northern Baja Peninsula. This is also the site of Mexico’s National astronomical observatory. There are two large telescopes sitting up on the high granite ridge. The meadows below this ridge are a fantastic place to stargaze and do some telescope observing or astrophotography. That is, if you are an astro-nerd like I am. A beautiful morning dawns in Parque Nacional Sierra de San Pedro San Martir, in Baja California Norte, Mexico. The park is located 50 miles or so up a side road from Mexico Highway 1, which runs down the long Baja California Peninsula. The turnoff is about two hours south of Ensenada, which is itself about an hour south of the border at Tijuana. The road is a good one, but watch out for the dips (where arroyos send floodwaters across during infrequent rains). If you are traveling south toward the beaches of southern Baja, it is a nice side-trip. A big ponderosa pine pierces the blue skies above Sierra de San Pedro Martir National Park in Baja California, Mexico. The delightful, open forest is largely ponderosa pine, and the mountains are made up of a very pretty white granite, speckled with black crystals like salt and pepper. The granite makes for superb scrambling, and the meadows and open forest are perfect for hiking and/or mountain biking. Perhaps the best part is that it’s not a very popular park. When I visited for the first time, in 2003, there were no facilities, no gate, no rangers. I simply drove out into the meadows along sandy tracks and camped. Climbing the rugged granite peaks of Sierra de San Pedro Martir National Park in Baja California Norte, Mexico. When I visited this time, however, I came on an official entrance, with a building housing your typical friendly, mellow and bored Mexican park rangers. It cost actual money to enter now, but only 54 pesos (about $4) per day. This covers camping at the nearby official campsite. It is no longer okay to pull off and camp anywhere in the park. There is also a museum, a newish and beautiful building. Official trails exist, and there are picnic areas scattered about in the pines. A ponderosa pine cone has fallen in the forest, in Baja Mexico. The astronomical observatory is undoubtedly the main reason the road is paved and in good condition. It’s possible to arrange a visit, by day of course. The development of the park over the past several years probably means they were having issues with people just showing up at the observatory at night, headlights blazing. Also, dispersed camping is a serious fire hazard, because many people cannot seem to be responsible with campfires. The telescopes could easily burn down in a big forest fire. The Mexican astronomical observatory sits atop a high, forested mountain on the Baja Peninsula. Signs urge visitors to care for the plants and animals of the park (“cuidada la flora y fauna”). But there are cattle grazing in this national park, so how serious can they be? Some areas have been hit pretty hard by the stock. If you’re lucky, you might see deer or bighorn sheep here; maybe even a mountain lion (puma). As I mentioned, scrambles are fun and challenging. I took a hike one afternoon and spied a granite peak that looked to be easy to get to. But when I tried to hike there, things got difficult in a hurry. It was challenging finding a route to the summit amongst enormous granite boulders. I had to squirm through cavities and caves, friction-hike up granite slabs, and use some climbing moves to finally make it. And though the view was expansive, the sun was dropping rapidly. I made it back to the track I had been following just at dark – cutting it close yet again! The nights grow very cold up here, so you don’t want to spend the night in the open. Reddish madrone and granite make a pleasant color combination on a climb in Sierra de San Pedro Martir National Park, Baja Norte, Mexico. This is a gorgeous park that is a world away from dusty and busy Ensenada. If you’re a stargazer, and have a small telescope (which you should bring if you drive to Baja), it is the perfect place for peering into the heavens. For those from northern latitudes, this is a good chance to see more southerly deep space objects. It’s easy to spend 2-3 nights here, hiking or biking the trails by day and camping under the stars. So as a Baja side-trip, Sierra de San Pedro Martir is definitely worth considering. One last look back at the surprisingly difficult granite peak I climbed in Baja Mexico’s Sierra de San Pedro Martir National Park. As our state’s only National Park, we in Oregon really cherish this paradise in the southern corner of the state. Crater Lake is North America’s deepest and one of the world’s clearest lakes. It is famous for its deep blue color, its clarity, and its geologic background. When John Hilman became the first white explorer to see it in 1853, he was astounded, calling it a very deep, blue lake. For me, it seemed past time to re-explore Crater Lake during the summer-time, when it is most accessible. My last visit a year and a half ago was during the depths of winter, when cross-country skis and snowshoes are the only mode of transport. I spent three days there last week. 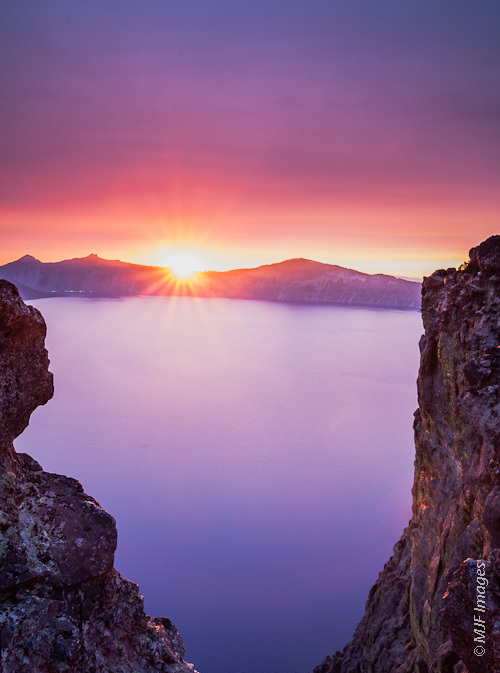 Crater Lake in southern Oregon was described by the first white person to see it as a “deep blue lake”. Crater Lake is about 6 miles across and almost 2000 feet (600 meters) deep. What makes it such an awesome and unique lake is that it lies within the throat of a big collapsed volcano, a caldera, which suffered its climactic eruption about 7000 years ago. It is not technically a volcanic crater, which is the word geologists apply to the hole in the top of a volcano created when the volcano explodes and ejects material out over the countryside. Geologists figure that the original volcano, which is called Mount Mazama, was over 12,000 feet (3600 meters) high and quite massive. 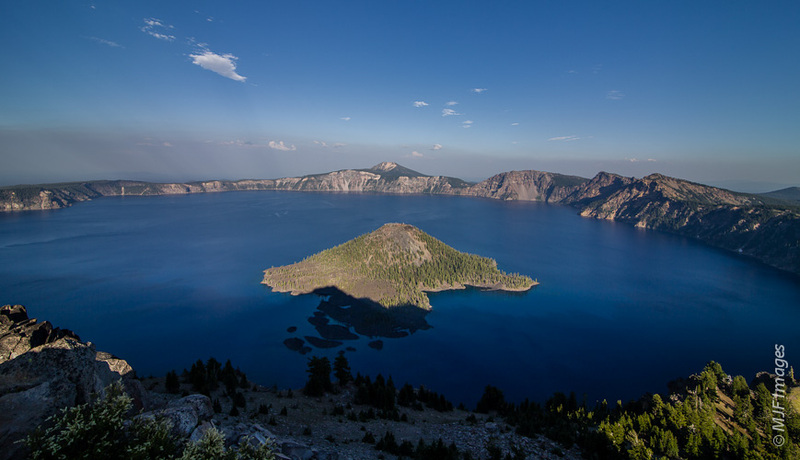 The Phantom Ship, a small island in Crater Lake, Oregon, is so called because in certain light conditions it seems to disappear. Calderas are generally larger than craters, and are created when the volcano erupts magma from beneath its summit, leaving a void underneath which leads to a massive and catastrophic collapse of the summit area. Caldera eruptions can be large, and they can be enormous! They are almost never modest in size. They are this planet’s biggest volcanic eruptions. And speaking of volcanoes and National Parks, Yellowstone (the world’s oldest park) is occupied by what is probably the world’s largest active caldera. It could erupt any year now (or it could take 10,000 more years! ), and with devastating consequences. In Crater Lake’s case, rain and snowmelt (mostly snow) filled the caldera over the period of a few hundred years, and now evaporation is balanced with precipitation so that the water level never fluctuates by much (it’s varied only about 16 feet (10 meters) over the last 100 years. There are no streams leading into or out of the lake. The rim of the caldera, where most visitors congregate, is at an elevation of over 7000 feet (2000 meters), and at this latitude, and next to the moist North Pacific, that means major snowfall – 40 or more feet (13 meters) every winter. One of America’s most scenic roads follows the treeline rim around, with numerous pull-offs. So like most American National Parks, one can certainly experience “overlook fatigue”. But probably not as much as some (Blue Ridge Parkway & Bryce Canyon spring to mind). It is at least 1000 feet (300 meters) down to the lake from the rim, and it is so steep that only in one spot is it possible to hike down to it. Here is your cure for overlook fatigue. 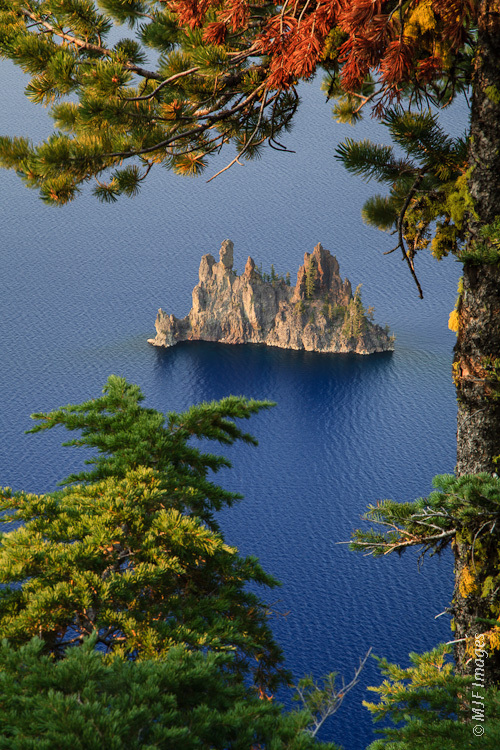 Hike down to Cleetwood Cove, and take a scenic boat cruise out to the largest island in the lake, a volcanic cinder cone known as Wizard Island. Here you can swim in the cold lake and hike to the summit of the cone, spending hours on the island. There are also numerous hikes from spots along the rim, including The Watchman and Mount Scott. I came here to reconnect with one of my favorite National Parks, and to try for some great shots of the stars over the lake (later post). The park is unlike the popular National Parks such as Yellowstone, Yosemite and Great Smokies. There are few policemen posing as rangers here, so you can pretty much do your own thing and not be hassled. For example, I rode my motorcycle there, arriving at night after one night spent near McKenzie Pass, a stunning spot in its own right. Once inside the park, I parked at a picnic area and walked up to a level spot on the rim to pitch my tent. I had to find a site screened from the road below, but otherwise had no worries about rangers prowling the roads at night, hoping to catch scofflaws like me camping illegally. I had a stunning view out over the lake, as the Milky Way soared above. Then at dawn, I woke to take pictures of sunrise over the vast expanse of blue water below. Coffee was conveniently taken at the picnic area where I parked the bike. I left my tent there for the next two nights, sleeping as late as I wanted with only hawks for company. I was on the quiet north rim, well away the park’s only real concentration of people (at Rim Village on the south side of the lake). There is one large campground a few miles below Rim Village, called Mazama. This is where RVers go, and where most official campsites in the park are. There is also a small, tent-only campground at Lost Creek, in the southeastern corner of the park. But since there are only 16 sites, it always fills early in the day. It is worth trying for this camp first, and if that fails, going to Mazama (which can also fill, even during the week). 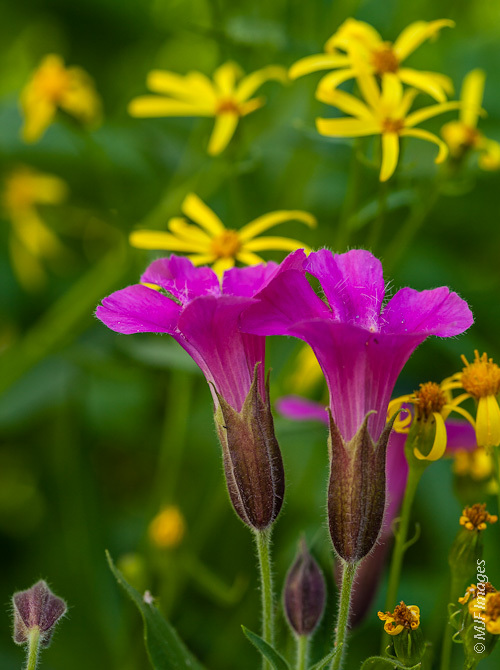 Wildflowers at Crater Lake National Park, Oregon, include pink monkeyflower. I did one major hike and a few smaller ones. I hiked to the top of Mount Scott, the highest peak in the park. At almost 9000 feet, it was the only remaining major Cascades peak in Oregon that I had not yet climbed. Some of my climbs have been technical, some (like Scott here) just hikes. But I have been longing to return to Crater Lake in summer for no other reason than to finish my quest. Now it is time to finish the rest of the Cascades, a few in Washington and one in Canada. Wildflowers and some friendly fellow-hikers were my reward. The view was rather hazy because of fires in the region. On my last full day at Crater Lake the smoke cleared in late afternoon and I was able to get some nice shots of a small island called Phantom Ship in late-day light (image above). Then I ate a picnic dinner, lay back and watched the stars come out one by one. I finally jumped on my bike and rounded the lake to a point where the Milky Way was perfectly placed. There I spent a couple hours shooting long exposures, stars over the lake with a starkly beautiful whitebark pine snag for foreground. Hiking up to my campsite on the rim at about 1 a.m. I fell immediately into a deep sleep. Utter peace for this moment in my life, atop a giant volcano that had its day of great thunder long ago, and now lies also in deep slumber, beneath the deep & cold, clear-blue waters of Crater Lake! Sunset over Crater Lake from the highest point on the rim, Cloud Cap.